Between days out fishing, Roger likes to do things that are less relaxing.. In 2009 he walked to the North Pole. In 2010 he rowed from London to Paris. In 2011 he walked up Mount Kilimanjaro. In 2012 he took part in the 3 peak challenge. In 2013 he arranged an expedition through part of the Sahara desert. He took a year out in 2014 to get involved with charity work in Kenya. In 2016 he made a great attempt to row the Atlantic. Not bad for a 72 year old who has already had a heart attack! Which is probably why he is also a popular after-dinner speaker! Upload Your Catches for 12 chances to win a box of fishing flies! This fly is one of our library flies. 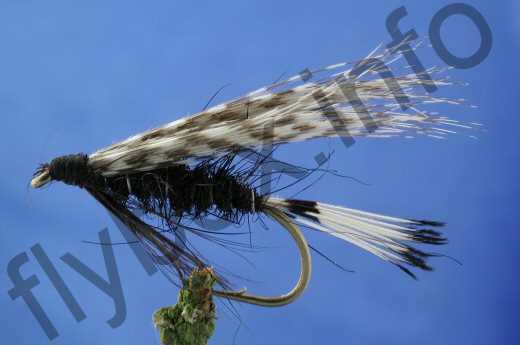 If you want this fly, register your interest and be notified once this pattern arrives in stock. Once this pattern becomes available for sale we will send you a non-intrusive notification via your browser or mobile. We would also like to notify you via email once this is available. Please Note: The first time you make a request you may be asked to accept or block notifications from us. Please choose 'Accept', otherwise your request may not be processed. This service is still in Beta; if you suspect a problem please let us know my contacting us. The Teal and Black is an excellent variant of the Teal and Red that works well for both brown trout and sea trout on the rivers of Devon. It is also a first class lake fly, as is the similar Peter Ross. Tail : Lady Amherst tippet. Body : Black seal's fur. Rib : Fine silver wire. Currently there are no comments about the Teal and Black fly pattern from other fly fishermen yet. To make a comment, please sign-in or register securely with us.